There are lots of different gumbos in this world and every one of them is special with its own unique story. My favorite is chicken andouille sausage gumbo! The roux is what gumbos have in common. A roux is made with almost any type of fat and flour in equal parts – some cooked to a light blond, medium peanut butter brown or dark chocolate. I use a light blond roux to make gravy and to start off my goat cheese Alfredo sauce, too. We also use a version of it for making the sauce for white chicken enchilada casserole. For this chicken andouille sausage gumbo we are making a dark brown roux. So the first time I fell in love with chicken andouille sausage gumbo was in NOLA at The Gumbo Shop in the French Quarter. And every time I visited New Orleans, I would take whoever I was with, however hungover we might be, to stand in a long line just to get some of that amazing gumbo! As it turns out that gumbo is an award winning recipe, too! So you can only imagine my extreme joy when The Gumbo Shop published a cookbook with the recipe for their fabulous chicken andouille sausage gumbo! And so I’ve made it over and over and over again since I bought the cookbook in October of 2010. Yes, I really do love this gumbo! But what types do we use in the GF, DF version? I’ve tried to make a roux with butter (pre-casein/dairy free days), coconut oil, ghee, avocado oil and olive oil. I used certified gluten free oat flour the first time I made it and really liked the outcome so I didn’t try any other gluten free flours. But almost any gluten free flour should work. I usually avoid flours that contain xanthan gum. Now this recipe takes a lot of prep and work but it is worth it! I make a huge batch and freeze most of it for lunches. I find that it works even better than chicken soup when my allergies get a little out of control or I feel under the weather. It has magical healing powers. Okay, I’m going to walk you through the steps in the recipe box below but here are some of the things to make sure not to miss. If this is your first time making a roux, you should consider doing a TEST RUN with equal parts of the oil and flour you will be using. You want to see how far it will go before truly burning (this was one of the best tips from The Gumbo Shop Cookbook). You want it to be almost burnt – and every stove temperature and cooking vessel is different. So this is where a little experimentation is worth practicing at least once before you invest the money, time and ingredients. Add the tomatoes, fried okra and sausage next and cook for about 15 minutes before adding the spices and chicken broth. Here you also don’t stir constantly but rather let it brown on the bottom and scrape up the burnt bits. I like to prep the okra before starting the roux and set it aside until this step. Sometimes I prep the tomatoes beforehand, too. I usually cut the sausage while the roux/mirepoix is cooking. The gumbo takes another 1 1/2 hours to cook after adding the spices and broth. The chicken is added during the last 15-20 minutes. About 20-30 minutes before the gumbo is done, start cooking the rice to go with it – we use white basmati rice from Pakistan because it has the least amount of arsenic. Soak the rice for about 10 minutes, rinse well with filtered water, and then cook for 10 minutes in water with a splash of olive oil. I love freezing the leftover gumbo in these 1 1/2 cup glass containers from Crate & Barrel. When freezing the gumbo, cool it an ice bath to reduce the temperature before transferring to storage containers then freezing. If you are also freezing rice, store it in separate containers. Okay! Piece of cake, right?! Well I promise it is worth it my friends. Enjoy the fruits of your hard work with a little (or a lot) of Tabasco or Frank’s RedHot hot sauce for absolute perfection! What is your favorite type of gumbo? 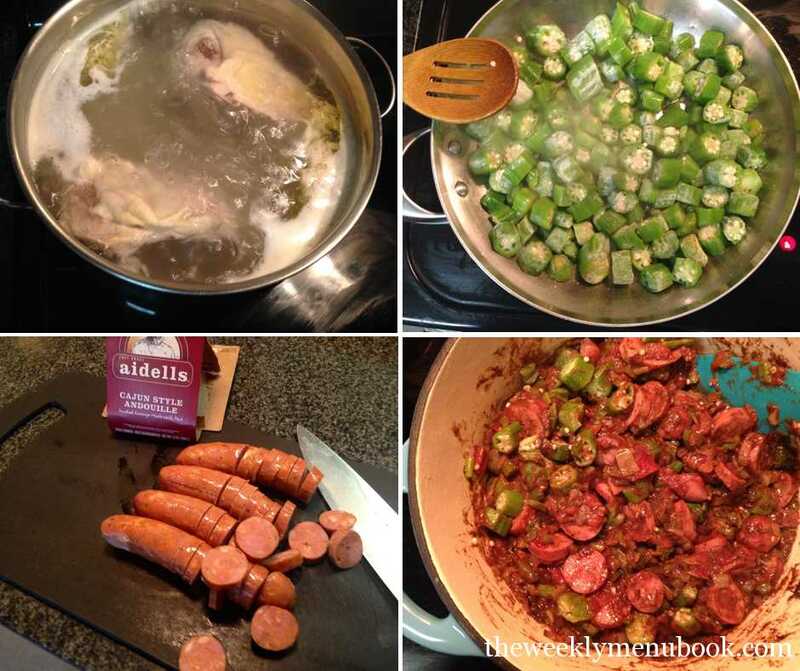 This is a gluten-free and dairy-free recipe for chicken andouille sausage gumbo with a deep dark roux. Put the chicken in a large stockpot and cover with 3 - 4 quarts cold filtered water. Bring to a boil over medium high heat and then simmer for about 1 hour over medium heat, skimming impurities off the top as it simmers. Pull the chicken from the broth and set aside to cool, preferably in a bowl and cover with foil until ready to shred. Cover the broth and save until needed. Once cool enough shred the chicken and discard the bones. Meanwhile, mix the spices and set aside. Wash, rinse and dry the green bell pepper and tomatoes (if not canned) before prepping. Rinse the celery. If fire-roasting the tomatoes, cut in half, remove the cores and deseed. Place under the broiler for about 10 minutes. Let cool a bit then remove the skins and chop. If using canned whole tomatoes, remove each tomato and cut out the core, deseed and chop. Save the tomato juice from the can. You need 2 cups/16 ounces of flesh and juice. Prep the Cajun mirepoix (diced celery, green bell pepper and onion) and set aside. In a large skillet, heat the 2 tablespoons of olive oil (EVOO) over medium high/high heat. Add the frozen or fresh okra and stir occasionally for about 10-15 minutes. Fry the okra until all the stickiness is gone. Slice the Andouille sausage and set aside. In a large Dutch oven, melt the 1/2 cup oil for the roux over medium heat. Add the oat flour and stir continuously with a wooden or silicon spatula until a dark brown roux develops. Add the mirepoix - diced onions, celery and green bell peppers. 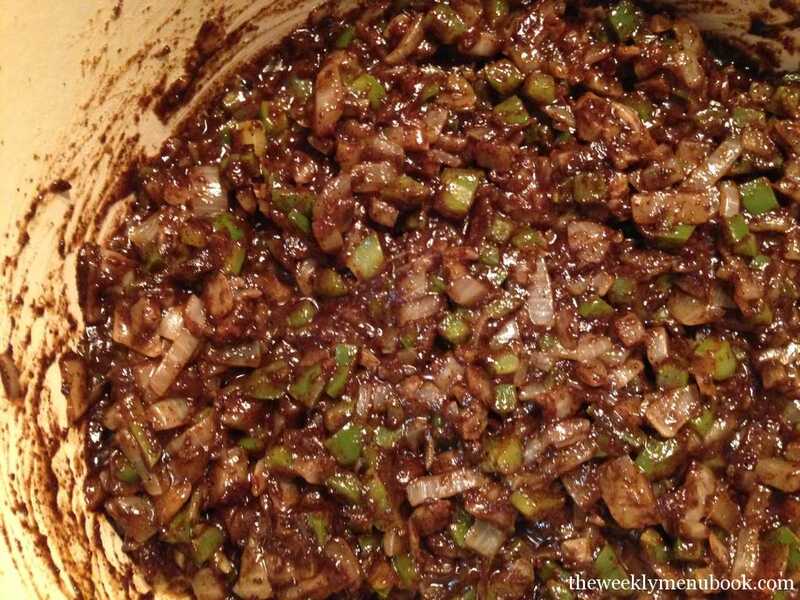 Stir occasionally for about 15 minutes, allowing the mixture to caramelize on the bottom to develop deep flavors. Add the tomatoes, fried okra and sausage. Reduce heat to medium and cook for another 15 minutes, stirring occasionally. Strain the chicken broth and add it to the gumbo in the Dutch oven (as much as fits in the pot). Save the rest. Stir well and bring to a slow boil. Lower heat and simmer uncovered for about 1 1/2 hours. About an hour after cooking add the rest of the broth if there is room in the pot. Twenty minutes before serving add the shredded chicken and adjust the seasoning (usually about 1-2 tsp salt). Serve in a bowl with rice and a dash of your favorite hot sauce. 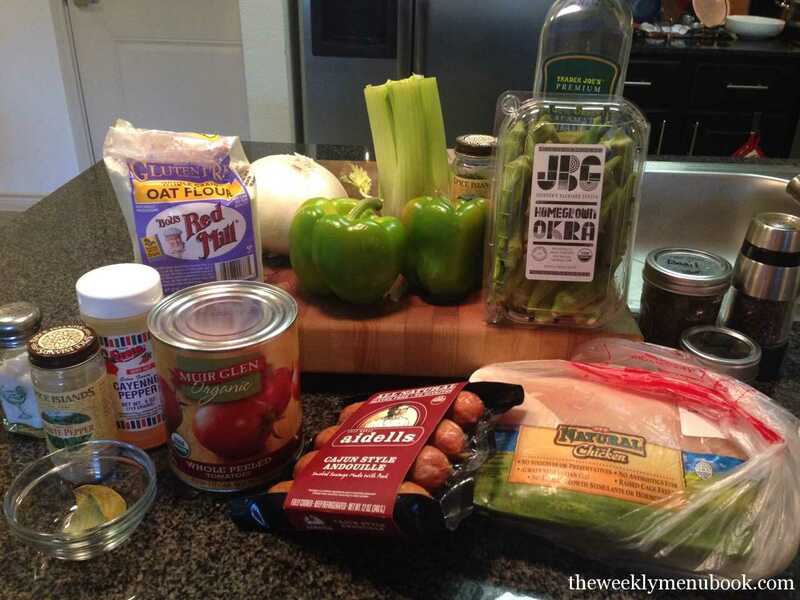 Want More Recipes Like Chicken Andouille Sausage Gumbo?